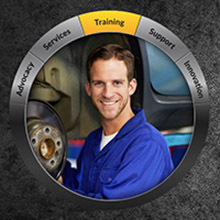 MTA Institute puts its training graduates right inside the Professional Circle. The Motor Trades Association of Queensland has been respected by business, Government and the vehicle owning public since the association’s inception in 1929. Now, in our globally connected environment, the critical factors of ‘trust’ and ‘professionalism’ are more important than ever. We proudly announce that the MTAQ has established a new level of connection for all stakeholders in the motor trades. Introducing the MTAQ Professional Circle… a new concept that encompasses, above all, professionalism. Training is one of the 5 pillars of the Circle… Advocacy, Services, Training, Support and Innovation… and is a key to the future skilling of the industry. MTA Institute, as the Registered Training Organisation of Queensland’s leading motor trades industry body, incorporates all the brand values that are inherent in the MTAQ Professional Circle. For MTAQ Members, using MTAI for training is a seamless continuation of the value of being in the Professional Circle. For other motor trades clients, who recognise the quality and effectiveness of MTAI training, it is a chance to experience for themselves, through training, the high standards that come with the Professional Circle… and how their staff and businesses benefit from the outcome. The benchmark of training standards. MTAI was created to address the real challenges around quality training and flexible delivery. Our focus is to provide high quality, reliable automotive training, which has seen us grown to become the largest private provider of automotive vocational training in Queensland. We have over 2,000 learners enrolled each year across Queensland. Most of these learners are apprentice light vehicle motor technicians, heavy commercial vehicle technicians, auto electricians, motorcycle technicians, automotive body repair technicians and automotive refinishing technicians. Our world class facilities, at the only officially endorsed automotive training centre by the late Sir Jack Brabham, are state-of-the-art and provide the very best equipment, exposing learners to the very latest in technology. MTAI employs more than 35 trainers and educators who are based from Cairns to the Gold Coast as well as west to Toowoomba and Emerald, with their key responsibility belonging to the development and training of the apprentices. MTAI is a preferred supplier to the Queensland State Government as an automotive training provider. Funding for traineeships and apprenticeships is made available from the Department of Education and Training.